on October 30, 2016, 2:37 p.m.
SMG Insight, the sports and sponsorship arm of YouGov, has released ‘Sports MENA: Consumer Close-Up 2016’, the latest in its geographical sports market research series and the company’s second report covering the Middle East and North Africa. 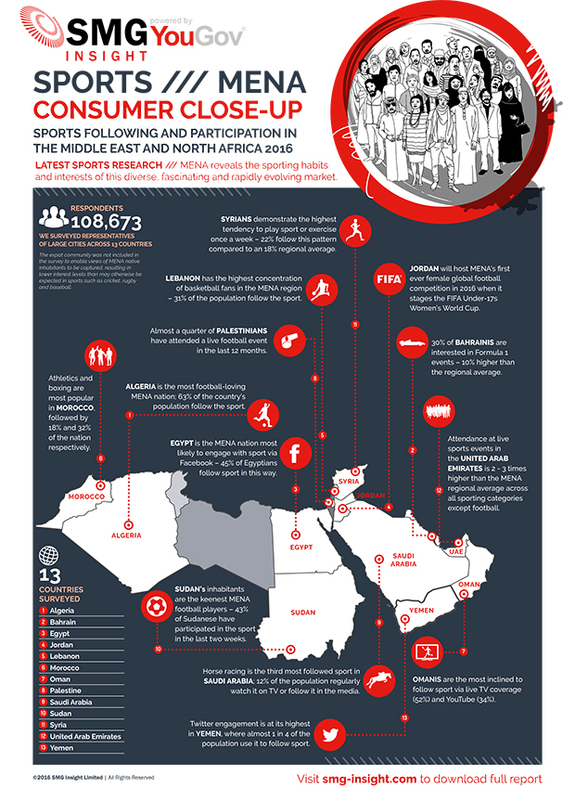 Surveying a representative sample of over 100,000 respondents across 13 countries, ‘Sports MENA’’s detailed insight and analysis reveal the sporting habits and interests of the region’s population*, focussing on following, participation, interest, live event attendance and media used to follow sport. Football has proven to be the most popular sport in MENA topping the rankings as the favourite spectator and participation sport in every country surveyed. Algeria is the most football-loving nation, with 63% of the country’s population following the game, whilst the Sudanese are the keenest players, with 43% of respondents having participated in football in the last two weeks. Athletics and boxing attract their highest concentration of followers in Morocco, at 18% and 32% of the population respectively, and tennis has replaced martial arts as the fifth most followed sport across the region. Increased global appetite for following sport via social media is manifesting itself in the region, with 45% of Egyptians engaging with sport via Facebook, 1 in 4 Yemenis using Twitter, and Omanis the most likely MENA inhabitants to follow sport through YouTube. Attendance at live sports events is highest amongst UAE inhabitants, who are two or three times more likely to be live spectators than their MENA counterparts. The UAE stands out throughout the report as a robust and growing market, firmly establishing itself on the world’s sporting map. ‘Sports MENA 2016’ reveals a market of contrasts: whilst investment and ambition soar in certain territories, economic and social instability continue to curb development across others; whilst 18% of the region’s population participate in sports or exercise once a week, 25% do so less than once a month; whilst significant advances have been made in women’s sport in the last five years, participation and following remains constrained in certain areas. *The expat community was not included in the survey to enable views of MENA native inhabitants to be captured but resulting in lower interest levels than may otherwise be expected in sports such as cricket, rugby and baseball.